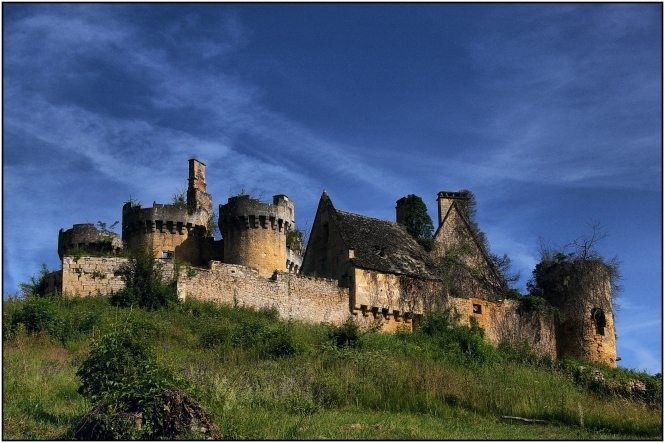 A crowdfunding bid to buy the film-star Château de Paluel in eastern Dordogne has failed when the auction price soared way above the €500,000 raised. The 15th century chateau in Saint-Vincent-de-Paluel near Sarlat went to Périgord Noir restaurateur Etienne Cluzel for €853,000 at the tribunal in Bergerac this afternoon. Made famous in the 1968 Louis de Funès film Le Tatoué where he came out with his famous comment “C’est une ruine! !” it sparked a bid by a group calling themselves Adopte un chȃteau who asked people to crowdfund a buy-out by pledging €50 each. This afternoon the funding site Dartagnans showed that 6,592 contributors had pledged €536,557, to be paid if successful. It is the largest amount of crowdfunding money raised for a French heritage project. Mr Cluzel, 31, who has two restaurants in Carlux, already has the Château de Sirey at Prats de Carlux, which he has been restoring for eight years. It is about a kilometre away from Paluel. He told France Bleu he wanted to open Paluel to the public in two years. He was in a bidding battle with two other bidders, from Normandy and Ile-de-France. See our previous story on the plan, earlier this month.